The Samsung Galaxy S9 doesn’t just have beauty - it’s pretty brainy too. And its brains are smarter than ever before, with Artificial Intelligence and Augmented Reality features that make life easier (and more fun!) for us humans. Samsung’s dedicated voice assistant, Bixby, is ready to answer your every query at the mere touch of a button. The Bixby button, placed under the volume keys, makes summoning Bixby super easy - you don’t even need to unlock your phone. Bixby has some great features, chief among which is that she (or he, if you change the default voice) is a fast learner. If she doesn’t understand you, just press the ‘teach me’ button and tell her which word she incorrectly identified. She promises to do better next time. Bixby Vision is a super-cool new feature, too. Want to know how many calories are in your apple? Point your camera at it, open Bixby Vision, and useful info about what the camera is seeing will pop up. If apples aren’t your thing, Bixby can also read and identify wine labels so you can sound like a fundi. In fact, she can read any text from a photo, and translate it, which is pretty nifty. Bixby can also recognise where you are from surrounding landmarks, and recommend places nearby. One of the S9’s most talked about features is the super fun ability to create an Augmented Reality (AR) emoji of yourself. It’s simple - snap a selfie in AR Emoji Mode, tap ‘Create my emoji’ and adjust it as you wish. You can change your hair, clothing and accessories. You can even create a Disney emoji if you fancy being Mickey or Minnie Mouse, or even an Incredible. The emoji can follow your movements and expressions for real-time reactions. It also creates 18 stickers automatically with a range of emotions for chatting fun. You can record videos or GIFs with your emoji, or use it as a still. 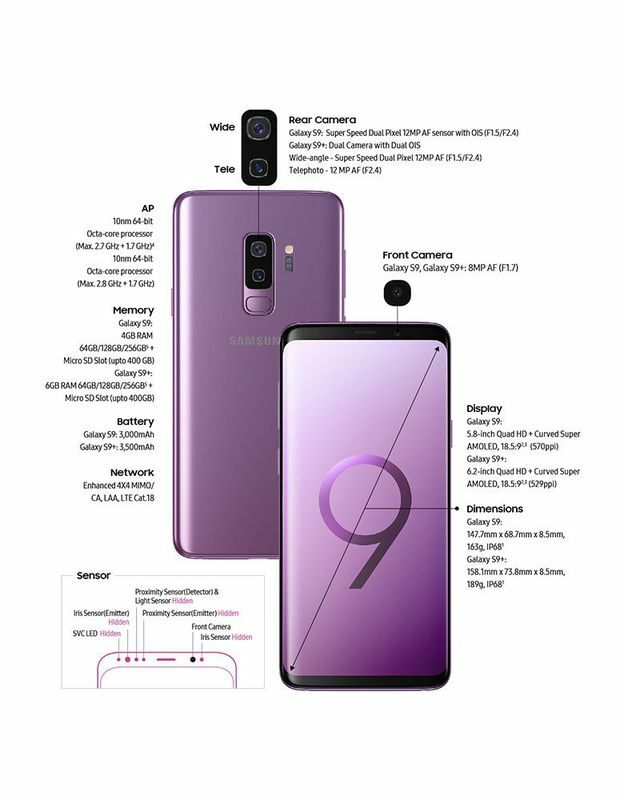 Read more about the features of the Samsung Galaxy S9 and S9+ here. Upgrade to the Samsung Galaxy S9 or S9+ on Vodacom Online, and get free delivery, free connection and free SIM.